I have used supermarkets in Germany (REWE, etc). But I found that whenever I purchase a bottled drink the price described on the selves was different from what I actually paid. For example in one case, one bottled juice was shown 0.95 on the shelf, but the actual price I paid was 1.10. At first I thought it is just my misunderstanding, but it sounds the same thing happend in most cases (or maybe always). I also wondered it is due to VAT and the price at the shelf doesn't include it. But 0.95 * 1.19 = 1.13, not 1.10. So what is happening here? Is this something like a credit card charge or an entrance charge? For your information I always used Amex or VISA to make a payment, and buy only one bottled drink which costs about 0.8 to 1.6 on the shelf price. You are paying for the drink and a deposit for the bottle. The deposit should be listed on the shelves, but usually in small print. Look for something like "zzgl. 0,15 Pfand". As to your initial thought, prices on supermarket shelves include VAT. There are deposits on many but not all drink containers, the rules are complicated. Deposits apply to non-reusable containers as well as reusable ones, this is to discourage littering and to make sure that the reusable containers are not an economic disadvantage. These deposits can be 8 ct, 10 ct, 15 ct, or 25 ct.
You can reclaim your deposit, even in a different shop than the one where you purchased it, provided they sell the same bottles. Most larger supermarkets have machines to scan the bottles and print out a receipt that can be turned in at the cash register. It is possible to reclaim money even if you do not buy anything. Most Germans return their empty bottles and claim the deposit, of course. When you do not want to do that, it is considered polite to put the bottle next to a public waste bin, not into it. Some people will collect them and reclaim the deposit as a way to make a little money. Prices in supermarkets in Germany always already include VAT. What you've been paying extra is called "Pfand": basically a deposit for the bottle, which can be reused or recycled. You can return the empty bottle in the supermarket to get that money back. Considering the amount you paid (€0.15), the juice you bought was in a refillable bottle of 0.5L or more. If you don't want to be charged the deposit when you purchase your drink, look for single-use bottles/cans (i.e. 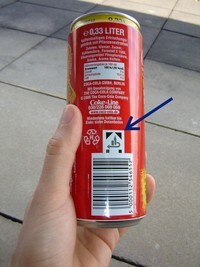 PET bottles, aluminum cans or Tetra-packs) which don't have the icon. Not the answer you're looking for? Browse other questions tagged germany shopping or ask your own question. What is required to visit my girlfriend in Germany from South Africa? When planning to drive through Germany, what speed does the navigation system use for limitless highways? Can I travel to Germany from a country different from the one I got the visa from?